Ikea will no longer sell halogen and ‘energy-saving’ compact fluorescent bulbs from September, when it switches all its lighting sold globally to super efficient light-emitting diodes (LEDs). The move affects over 2.3 million bulbs sold by the Swedish furniture chain each year in the UK and an undisclosed number in its markets elsewhere in Europe, North America, Asia, Africa and Oceania. The EU was expected to ban certain halogen bulbs from sale from September 2016 but earlier this year delayed the ban until 2018, saying LED technology would not be ready in time. Steve Howard, Ikea’s chief sustainability officer, said that three years ago, shoppers experienced ‘price tag shock’ with LEDs, but now their quality and cost had reached a tipping point, and the time was right for the switch. 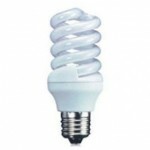 He said the company’s scale had enabled it to reduce the cost of the plastics and other components of the bulbs. It becomes the first retailer in the UK to sell only LEDs for lighting. As well as using much less energy than halogens – around 85% – and even less than CFLs, LEDs last longer, with an average lifespan of around 25,000 hours. 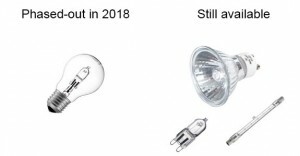 Ikea estimated that a household switching from 10 incandescent bulbs – which were banned from sale in Europe in 2012 – would save £300 a year on energy costs by switching to LEDs. “If you can help customers save energy and help do something towards climate change, that’s the right thing to do,” Howard said. He said that while households and businesses had to be engaged in tackling climate change, they could only do so much and that governments had to act too. “We’ll keep going with our direction regardless. But we recognise not every business is responding [to climate change], so at a national level we need strong regulation. Howard said it was important that government agreed a strong climate change deal at the later this year. “Business can do a lot, but we need good policy frameworks from governments, so Paris is important,” he said. In June, Ikea said it would spend €1bn ($1.13bn) on renewable energy and measures to help poorer countries adapt to climate change. The company has said that it will generate all of the energy used in its shops and factories from clean sources by 2020. Visitors will experience new opportunities to enjoy the night sky; focused lighting will enhance habitat for nocturnal wildlife; and enrich potential for new interpretive programming. The good lighting practices that have been initiated will result in energy efficiency, elimination of lighting spillover, enhanced visitor experience, and protection of cultural resources. With the new lights in place, Mount Rushmore National Memorial has now joined other famed landmarks that also feature customized lighting systems, including the Washington Monument, the Statue of Liberty, the White House, and the East Span of the San Francisco Bay Bridge. Light-emitting diodes (LEDs) are prevalent in everything from digital clocks to solar panels, traffic lights, electronic banners and signs, Christmas decorations, as well as smartphone and tablet displays. However, LEDs are created using organic materials that can be costly for researchers. The end result of the manufacturing process is that LEDs cost more for the consumer. While LED lighting systems last longer, are more energy-efficient, and provide an improved color gamut above that of fluorescent lights, the price is the technology’s greatest drawback. A new, cost-effective quantum dot (QD) hybrid LED could enable LED lighting system adoption on a mass scale. University of Hiroshima (Japan) researchers created the new light-emitting diode using silicon quantum dot solution and a polymer solution on top of an indium-tin-oxide (ITO) glass ply that was used as the anode for the LED. The silicon quantum dot solution was placed in the bottom of a glass vial that sat on a rotating stage. It was synthesized through pulsed laser ablation (PLA) with Tokyo Chemical Industry Co.’s 1-octyne solution (10mL) over several eight-hour periods. After the 1-octyne solution was removed and the silicon quantum dots solidified, they were then submerged in either 1) 2-propanol or 2) o-dichlorobenzene. “The color of Si QD solution is a transparent yellow but a white-blue PL is observed during the UV excitation,” the team wrote in its report. The study is the first of its kind to produce silicon quantum dot LEDs by way of a solution-based process and marks an advancement of LED technology, seeing that the use of organic film as the electron transport in past LED production resulted in a decreased photoluminescence and an inaccurate color reproduction. The solution-based process described here was done at room temperature and pressure, resulting in a more cost-efficient process by which to manufacture LEDs. Fluorescent bulbs are cheaper than LEDs, with a box of fluorescent bulbs costing no more than a few dollars, but consume more energy and lead to higher energy bills. LEDs are more expensive up-front, with some costing as high as $70 a piece, but conserve energy and money later on. Consumer choices in light bulbs for their homes have changed significantly over the past few years, and they appear to be doing so again. Compact fluorescent lamp bulbs, the market leader since most incandescent bulbs were phased out in 2014, are gradually giving way to LED lights, those semiconductor devices best known for their use in traffic signals and electronic appliances. A new survey commissioned by the lighting product manufacturer Osram Sylvania shows LED light bulbs gaining on CFLs as consumers increasingly buy them and find them preferable. CFLs remain the bulb of choice for most consumers, despite complaints about their light quality (they illuminate gradually) and the small amount of mercury that they contain. Fifty-three percent of those polled reported having bought CFLs for their homes in the past year, compared to 41 percent who had purchased LED bulbs. But survey results also indicate that CFLs may lose that lead in the not too distant future. The spiral lights were the preference for 37 percent of the respondents when they buy bulbs again, with LED lights were just behind, at 35 percent. Among non-LED users, CFLs are the top choice for replacement bulbs (45 percent), with only 18 percent indicating they would purchase LED bulbs an alternative. However, among LED users, 44 percent would most likely buy LED bulbs again. Interest in LED lights is likely to grow even more as consumers look closer at the efficiency and expected lifetime of the bulbs compared to CFLs and those disappearing incandescent bulbs. Government statistics put the annual cost of using a 60-watt-equivalent LED for three hours a day at $1.02, compared to $1.57 for a CFL and $7.23 for an incandescent bulb. It all adds up, especially when you consider that LEDs are expected to last years longer than CFLs. The European Commission today agreed with conventional lighting industry arguments and voted to postpone a ban on halogen lamps until September 2018. It did not, however, extend the ban until 2020, which lighting industry body LightingEurope had lobbied for. The decision is sure to rankle newer, LED specialist companies like Neonlite and its Megaman brand,who had argued against any extension. The EC had set the 2016 date back in 2009, giving the industry seven years to prepare for it. Halogens are a form of incandescent lamp – the EC has already banned others – and are highly inefficient compared to newer LED and CFL energy-saving lamps. But the industry lobbied hard in recent months to delay the ban, saying that seven years was not going to be long enough. It argued among other things that Europe would face a lamp shortage because there would not be enough quality LED lamps to meet general demand. It also said the industry needed more time to develop LEDs with features to which consumers are accustomed, such as standard dimming, multi-directional light beams, and good colour rendering, at an affordable price. ‘Postponing the phase-out will bring more efficient products to the market, and give consumers the possibility to choose the best performing lamp for their needs,’ the EC said in a press release. It did not immediately clarify its logic – more efficient products like LED lamps are already coming into the market, and it’s unclear how the 2018 extension will change that. Applying the same logic, the EC claimed that sticking with a 2016 ban would have cost European consumers €1 billion ($1.1 billion) in energy savings which they will now get by waiting until 2018. Some industry observers suggest that the EC delayed the ban to allow traditional lighting companies like Philips and Osram more time to adjust and to deal with difficult job losses associated with abandoning halogen. The ban does not apply to all halogens. 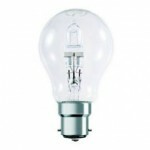 It mainly covers pear-shaped bulbs that look like conventional incandescent lamps but contain a halogen component. It does not apply to spotlights or to many desk lamps. Germany’s Osram plans to transfer its 2 billion euro ($2.5 billion) general lamps business into an independent legal structure, paving the way for a possible spin-off or sale and allowing it to focus on automotive lighting and components. The move to separate the declining business representing about 40 percent of its revenue, which follows a similar move by bigger Dutch rival Philips. lifted Osram shares more than 6 percent to an all-time high of 51.30 euros. Osram, spun off from engineering group Siemens two years ago, is cutting capacity in traditional lighting and streamlining sales and distribution operations, axing nearly a quarter of its employees over three years. Major light bulb producer Osram has given way and agreed to stop branding old-fashioned halogen products as ‘eco’ bulbs. Consumer groups accused the firm of trying to ‘greenwash’ their products, encouraging people to buy them because they think they are more environmentally friendly and could save them money. But in reality halogen bulbs are among the least energy efficient bulbs widely available today. They have been surpassed by several technologies including LEDs and compact fluorescent (CFL) bulbs – some of which will burn ten times less energy. 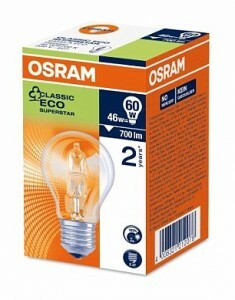 Now Osram has agreed to re brand its ‘Eco Superstar’ bulb as ‘Halogen Classic’. A spokesman for the Germany-based firm said: ‘We have decided not to use the term ‘Eco’ for our halogen products any more. ‘This change will be implemented in the course of an already planned packaging change. The Energy Saving Trust estimates that replacing every halogen bulb with LEDs will save a family £40 a year in electricity bills. Choosing the right light bulb can be tricky. Lumen, watt, colour temperature … what do these and other terms mean? Our helpful guide to light bulbs will give you a quick and easy overview of “what’s what” in lighting and will help you to find the right bulbs for every fixture in your home. When you are choosing a bulb to fit a particular light or lamp in your home you will first need to make sure you choose the right cap type. The cap is the bridge between the bulb and the power-source fitting, providing just the right amount of current to make the bulb glow. But one size does not fit all and as there are different types of caps, you need to make sure that they fit your light fixture. The most common are screw bases like the E27 for big fittings and the E14 for small fittings like candles and lustres. 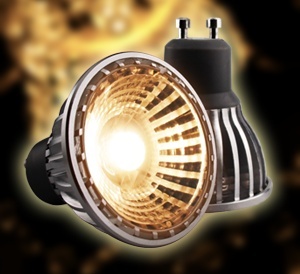 There are also specific caps like the GU10 and GU5.3 for spots, downlights or other special light fittings–GU10s were traditionally available only as a halogen bulb but LED variants are now available. Plus there are also B22d and B15d bayonet bulbs that are used in smaller fittings and finally low-voltage G4 and mains-powered G9 halogens. In short, they are the perfect choice if you are looking for the quickest and easiest way to replace classic bulbs throughout your home and still want to enjoy the same quality of clear, warm and sparkling light that you are used to. If you are looking for the most sustainable lighting solution, LED bulbs are the ideal choice for you. If you are looking for an easy way to save energy and reduce your lighting bills, energy savers are a great choice. with a dimmer switch, however, not all LED lighting is designed to be dimmable, and using a non-dimmable bulb with a dimmer switch can cause the bulb to not work properly or fail completely. So if you want to buy a dimmable bulb, make sure you check the product details to see if it will work with a dimmer. 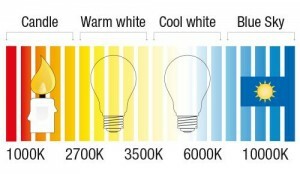 Modern bulbs can offer different colour temperatures, which are indicated in a unit called Kelvin (K). The colour temperature helps you create different moods–bulbs with a low Kelvin value generate warm, yellow light, which produces a relaxing mood, perfect for creating a cosy atmosphere in your home. Bulbs with a high Kelvin value produce cool, blue light for a more energizing mood and are ideal when you need to perform tasks that require concentration. Most people think that the wattage (W) of a bulb tells you how much light it gives. However, this is not the case as wattage only measures the amount of energy required to light bulbs. 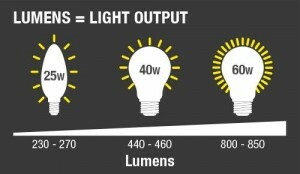 Lumens (lm), on the other hand, measure the amount of light that is actually produced. For example, some bulbs, like LED, give the same light output (in lumens) as a classic bulb, but for a much lower wattage. So, to see how bright a bulb is, think in lumens, not watts. The higher the lumen value, the greater the light output. Every bulb can only be switched on and off a certain number of times before it fails. This is known as the ‘switch cycle’. The room a bulb is being used in can make a big difference to its lifespan. For example, bulbs in a living room often stay on all evening, whereas those in a bathroom may get switched on and off much more regularly. 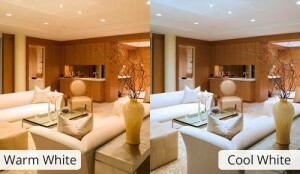 Think about which bulb best fits the room you’ll be using it in. Halogen bulbs typically have a switch cycle of 8,000, energy savers up to 30,000 and LED bulbs about 50,000. Colour rendering, expressed as a rating from 0 to 100 on the Colour Rendering Index (CRI), describes how a light source makes the colour of an object appear to human eyes and how well subtle variations in colour shades are revealed. Natural outdoor light has a CRI of 100 and is therefore the standard of comparison for any other light source. The higher the CRI, the more natural the colours appear. The shape of a bulb has a big impact on the light effect it delivers. This is because the shape determines the width of the light beam. Standard bulbs can achieve a 360-degree distribution of light (see example on the left), whereas spots can deliver a focused light distribution at a 25 to 35-degree beam angle. 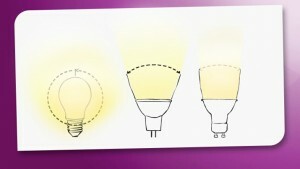 So keep in mind the width of the area you want to illuminate when choosing your bulb. Upgrade your spotlights with confidence. 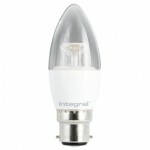 The Integral GU10 LED spotlight is a perfect replacement for inefficient 50W Halogen lamps – reducing electricity bills by up to 85% instantly. Another flagship product from the KTC (Kosnic Techology Centre), the new HaloLED from Kosnic is an uncompromising retrofit for halogen M16 lamps. The unique LED lens and COB (Chip-on-Board) deliver exactly the same ambience as the halogen, while enabling end-users to significantly reduce their lighting energy costs. Fully dimmable, the HaloLED 7 Watt version is perfect for hospitality applications where atmosphere and mood need to be varied according to the activity and time of day. 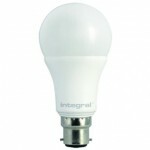 Also available in a 6 watt GU10 with a high light output of 400 Lumen. Long lamp life of 35,000 hours.